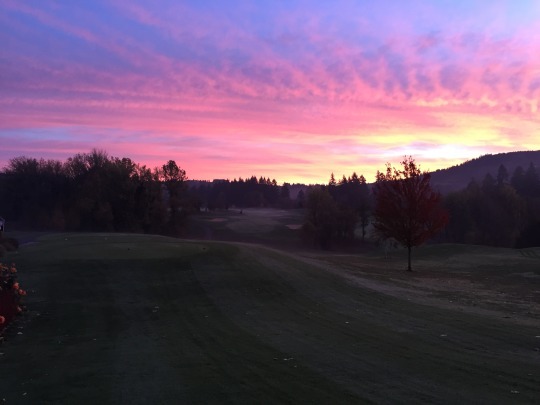 I made it a point to get up here early and be sure to get in a round on the first morning. 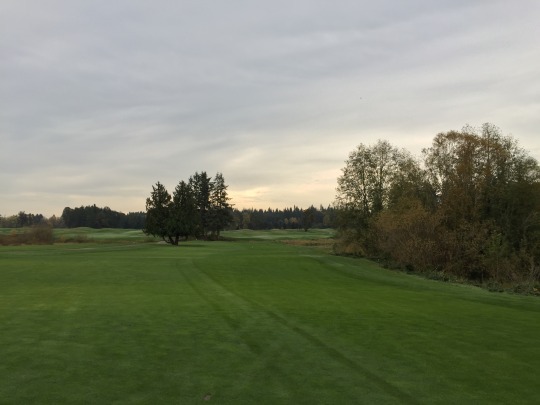 I set an 8:15 tee time through the course’s site because it was the same price on GolfNow (but without the booking fee). $65 with a cart I thought was somewhat reasonable for a Saturday morning. 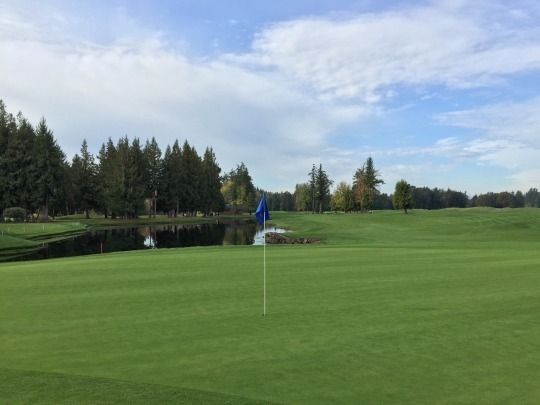 That’s on the higher end of the price spectrum for this area if you don’t count Pumpkin Ridge, but I’ve always heard The Reserve is one of the best complexes around and what I paid is the full weekend rack rate. So, figuring that’s as high as the price gets, it’s not bad. Also, walking is an option here ($49) and there were a lot of walkers out there because the courses are both set up well for it. There are two courses at The Reserve: North and South. 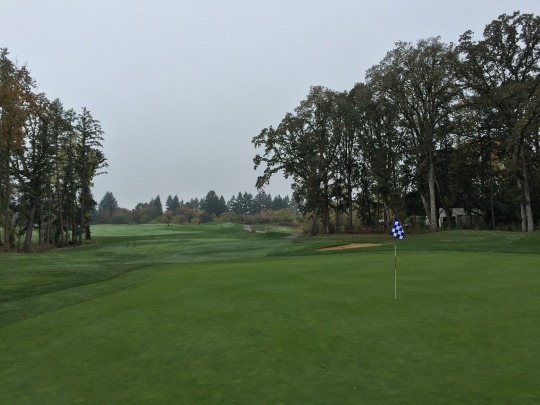 What’s interesting is that one course is generally reserved for member-only play while the other is open to the public. This time of year, they alternate every couple weeks. 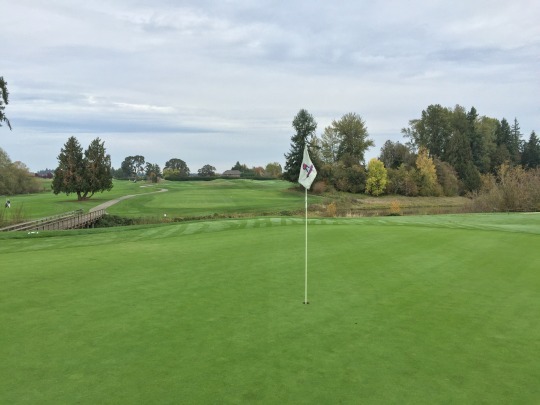 I played the North on Saturday, and I am hoping I might be able to squeeze in a round on the South before I leave town. It will be tight. The days are shorter up here, so it really doesn’t get light until almost 8:00. I was in the fourth group out behind a couple of twosomes and a foursome of members. They all played fast, so myself and the twosome I was paired with really never had to wait beyond the first couple holes. The group behind never pushed at all either, so it was a nice relaxed four-hour pace. The guys I played with walked. Otherwise, it probably would have been much quicker for us. What I may remember most about The Reserve is the conditions, which were excellent. Things were very wet and soggy in the morning and never really dried up during our round, but the grass was beautiful throughout the course. 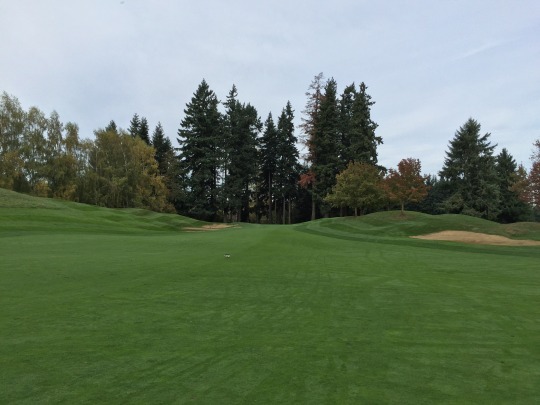 Things were very well kept and manicured from tee to green. 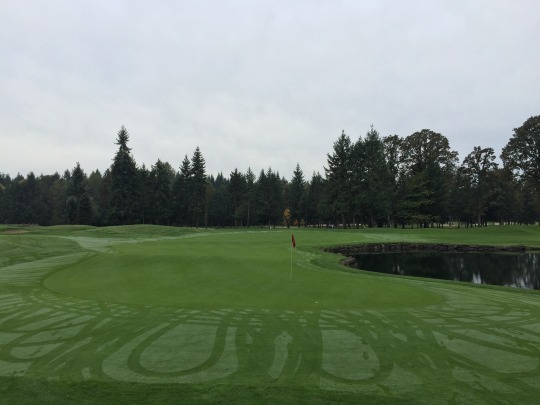 Speaking of the greens, they were aerated very recently. I was aware of that when I booked the time because the alert was on Greenskeeper.org and on the course’s site when I booked the time. 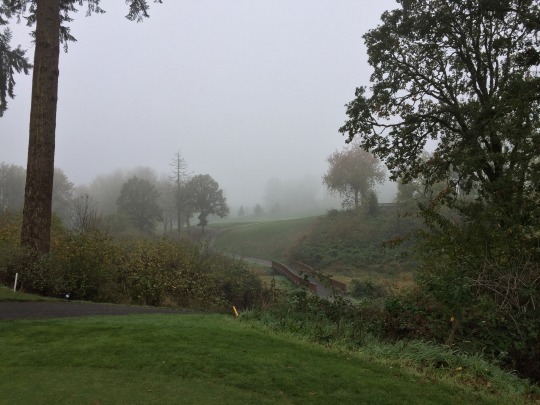 I knew I might not get ideal conditions, but most courses around here have punched within the last few weeks, so it’s just a nuisance I am expecting anywhere I play while here. However, the practice green was immaculate and rolling well. I walked over to the 9th green while waiting to tee off to see how it compared and there appeared to be no evidence of aeration. I talked with the starter and he said they used a new machine with a new aeration prong this year. Apparently, it pushes the grass down and fills with sand rather than pulling the plugs and leaving the big holes. 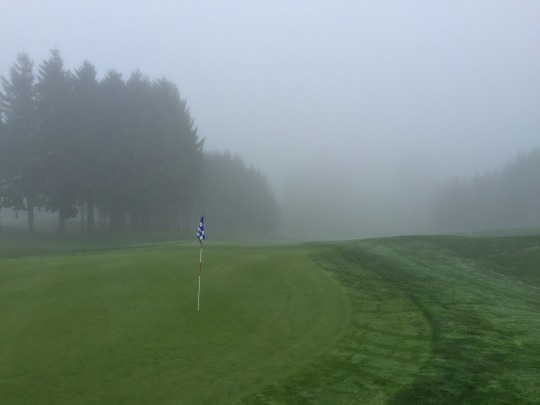 He said that the greens were back to normal within a few days! The exceptional conditioning may outshine the North Course itself when I reflect back upon my experience at The Reserve. That said, it is a nice course with plenty to enjoy. 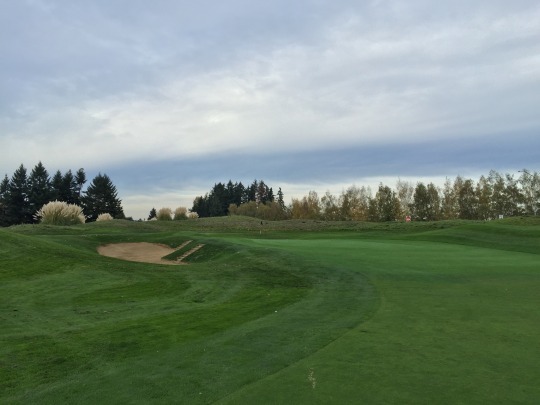 Overall, it’s more of a modern prairie links design by Bob Cupp, reminiscent of some East Coast and Midwest courses I’ve played in recent years. 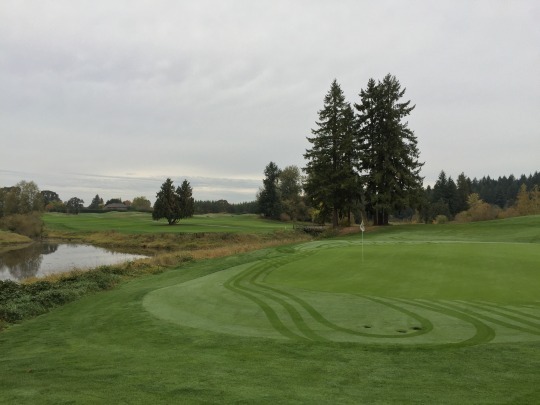 Some of the more open holes blend together, but there are a few different ones mixed in to shake things up. 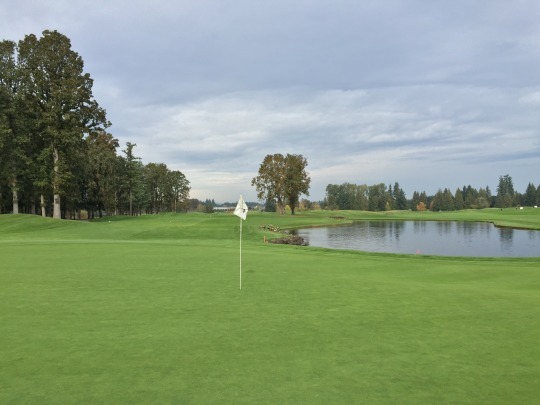 There is a stretch of holes that plays along a marshy water hazards and a few holes that bring trees into play along the fairways. 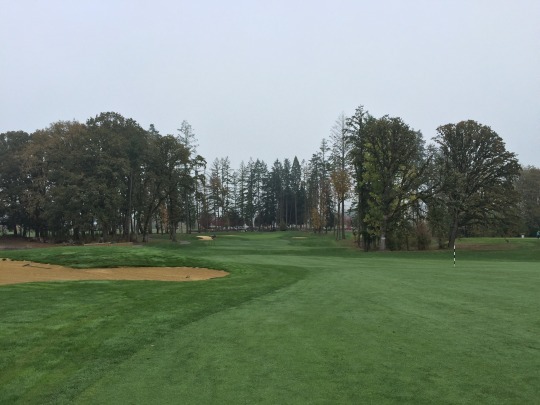 The South Course (designed by John Fought) definitely looks like it has more of a wooded overall look and I have a feeling I’ll like it more (at least aesthetically). 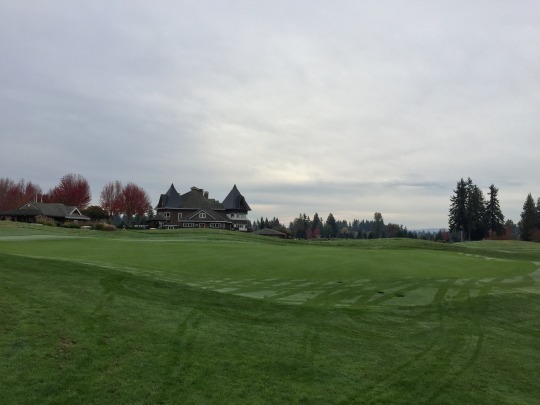 The Reserve complex has hosted some big golf events, including the Jeld-Wen Champions Tour tournament for a few years. The big clubhouse has a unique look and the facilities are fantastic all around. The staff was also super friendly. 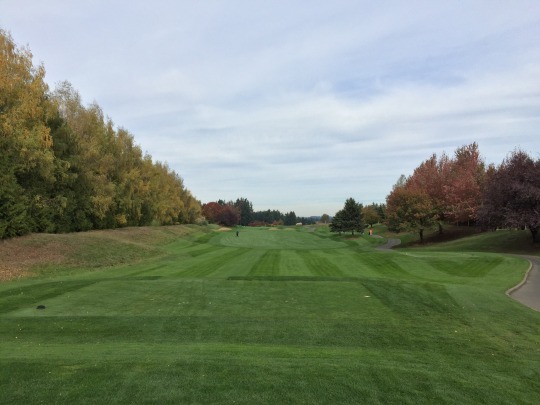 The North Course does feature a good mix of hole lengths, with some longer ones that are more wide open off the tee and a couple really short ones where strategy really comes into play. 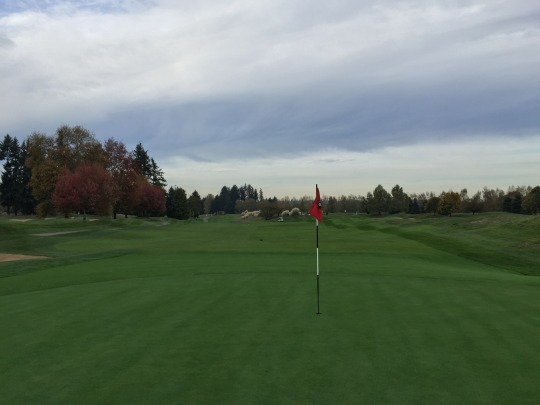 Maybe the most interesting feature is the three-headed green that connects holes 1, 8 and 17. 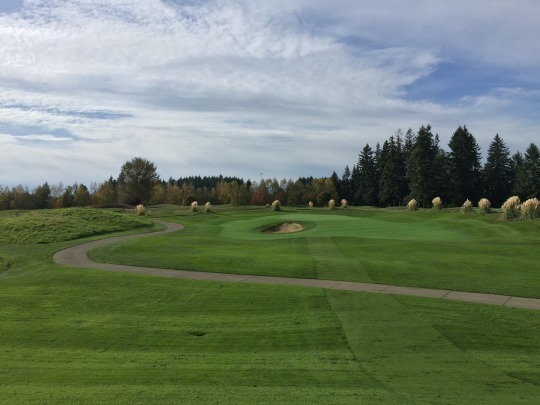 It is really spread out and it looks like they are letting the grass that connects the 1st green grow in more so it won’t technically be connected anymore, so there isn’t a lot of overlap. It was just kind of a cool set up. I’ve seen plenty of double greens, but I can’t recall a triple green anywhere else. Something else that caught my eye was the lack of sand traps throughout the course. 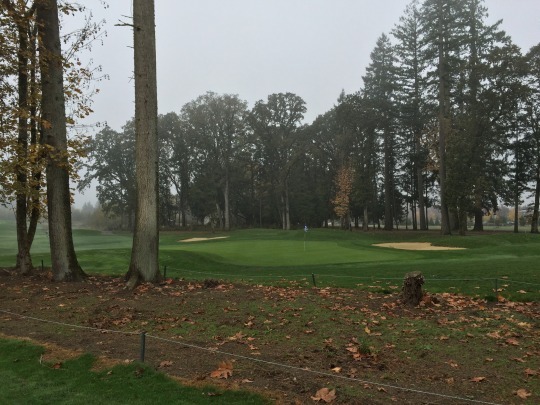 It really wasn’t until the 10th hole when I realized it had no bunkers up by the green. Then, i started thinking back to consider that I hadn’t really seen but a few all day. 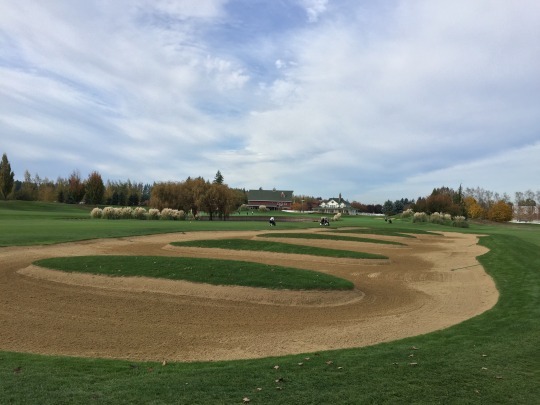 The guys I played with told me that at some point, they removed a lot of bunkers on both courses to soften the challenge, improve pace of play and appease the members. It sounds like there used to be a lot more. 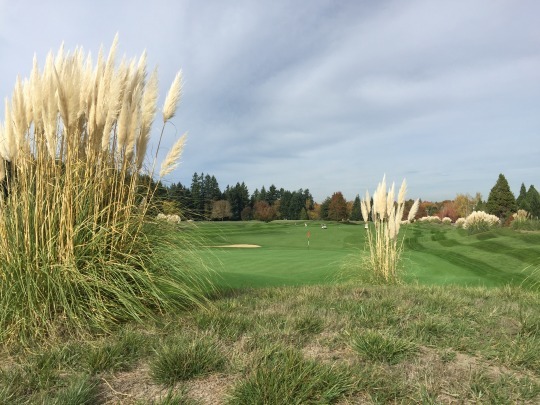 Now, there are many grass bunkers and mounds with some shaggy fescue rough that still provide some trouble worth avoiding and complement the links look. There are also a number of water hazards in play, so the North Course is still far from a pushover. 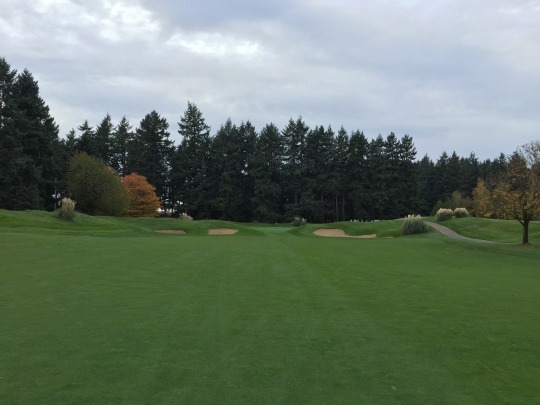 I would highly recommend The Reserve to anyone and I hope I am able to check out the South Course soon. 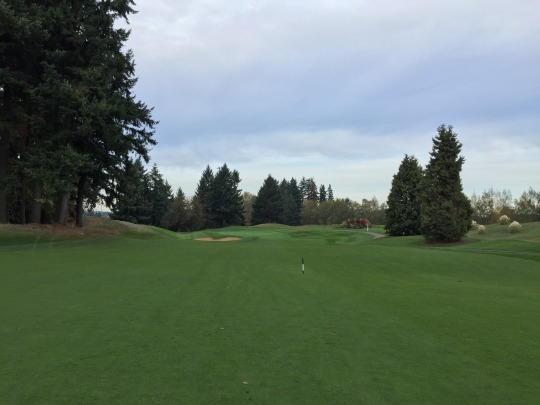 I am just scratching the surface for golf in this area, so I don’t have a lot to compare to, but it was a really good way to start my visit! 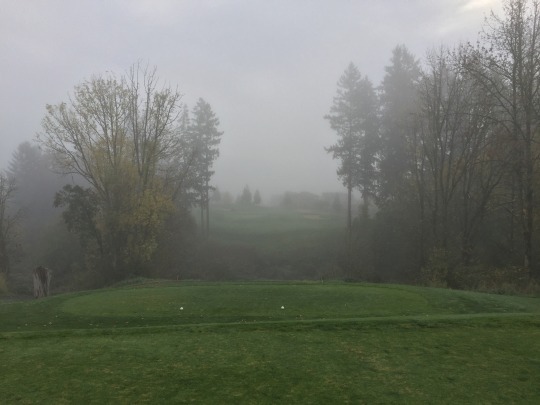 With heavy rain on Sunday and family obligations on Monday, it wasn’t until Tuesday before I could sneak back out for some golf. 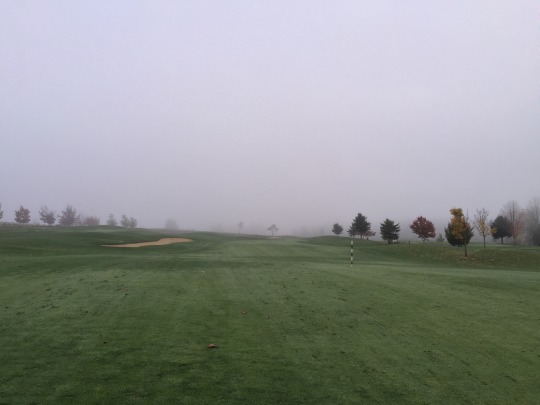 I took advantage of it by playing 36 holes. 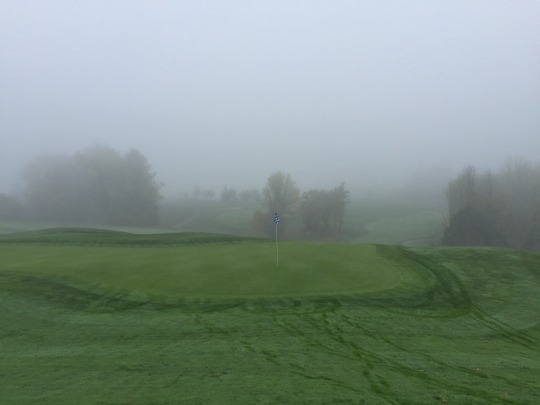 It was the last decent-weather day forecasted for the week, so I am not sure if I’ll be able to squeeze in any other rounds before leaving. 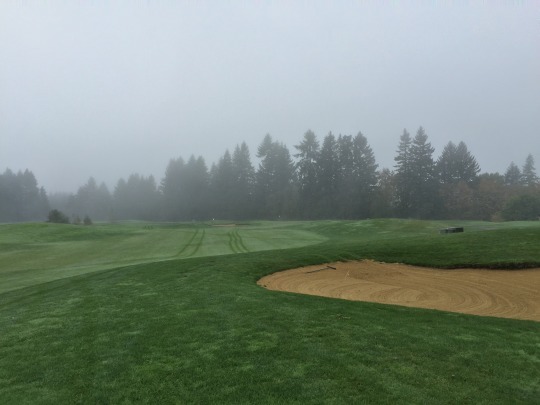 As I scoured tee time options Monday night, nothing was exciting me too much. There were plenty of options available, but not a lot jumped out. I did need to play more on the west side of Portland for convenience, so that narrowed down the field somewhat. 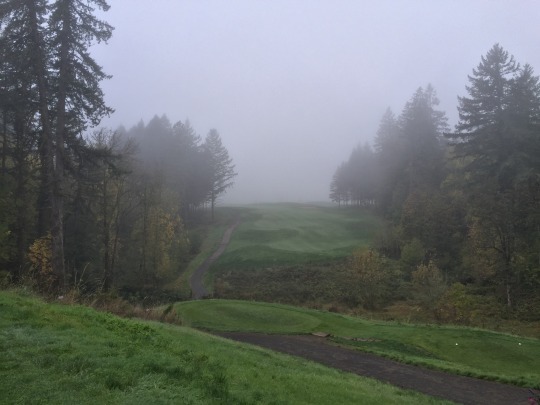 Of the courses I was looking at, Chehalem Glenn looked fairly interesting and when I saw they had an 8:06 GolfNow “hot deal” for just $15, it ended up being an easy choice. This deal was just the walking price, but I actually didn’t mind. It was cold in the morning, and I knew walking would help keep me warm. It was unfortunate because when I arrived, there was a beautiful sunrise and things looked to be clearing up. 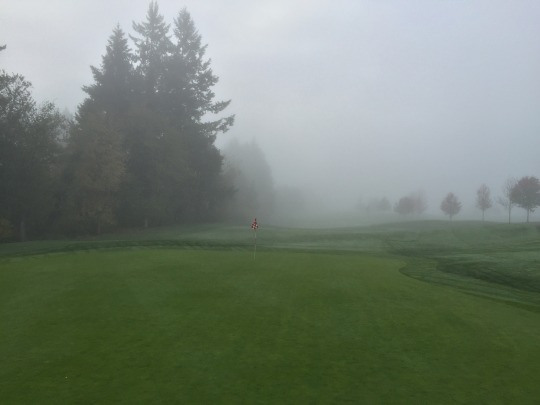 However, by the time I teed off, a dense fog had rolled in and blanketed the course almost the entire round. 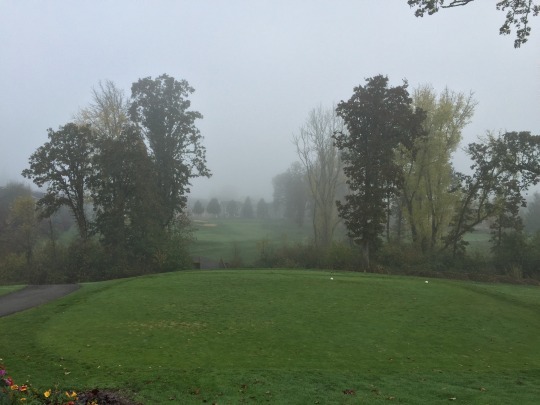 Needless to say, my pictures really won’t show much of what turned out to be a beautiful course. 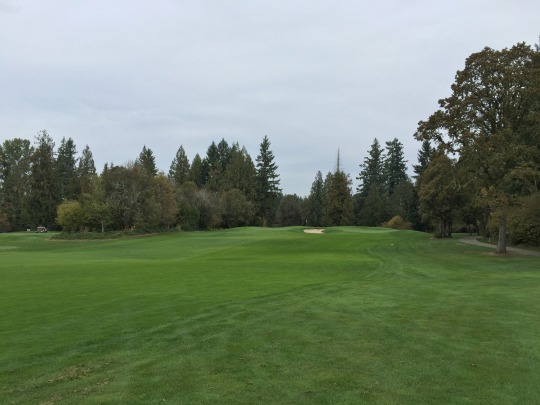 Though I had no intentions of getting a cart, I did flirt with major temptation to try out the new Golf Boards they have for rent at Chehalem Glenn. They are $25 to rent and you do have to watch a 7-minute video and sign a waiver. This is common practice anywhere they have them, so plan accordingly if you want to rent one. 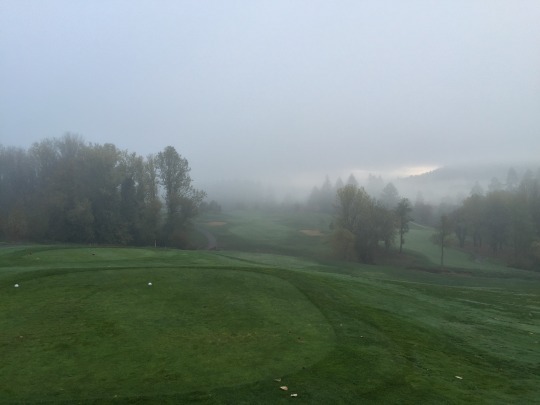 With the fog and the wet/cold conditions, it just didn’t seem like the right time to try a Golf Board out. You can be sure I will get on one eventually, though! 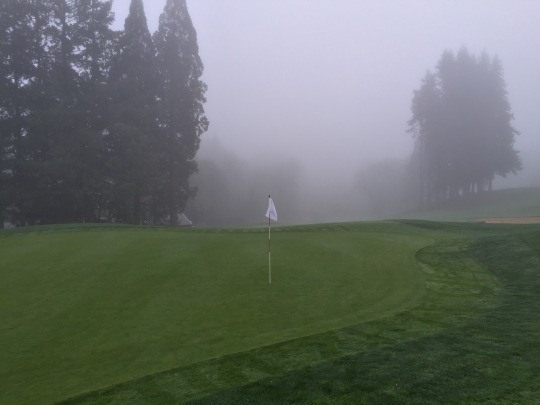 The fog definitely put a damper on the round, both literally and figuratively. I enjoyed the course a lot, but I knew I would appreciate it even more if I could have seen it better. I played along with another single and we went off second, walking behind another twosome in a cart. The total pace was nice at just under 3.5 hours. The guy I played with was a local and a regular player here, so he told me a lot about this course. 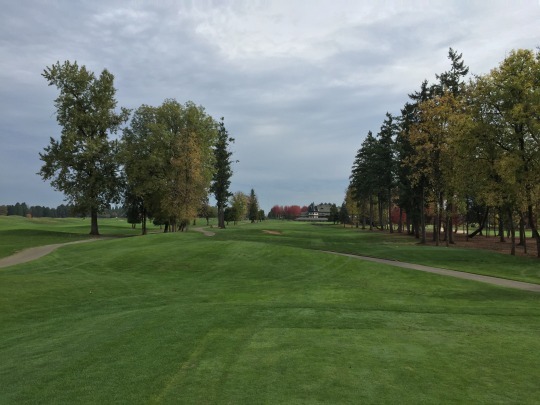 It seems this is a course that doesn’t get a ton of attention from locals. For one, it is definitely a bit out of the way in Newburg. Also, it is a fairly challenging layout and that keeps some people away. It is very hilly and there are a number of tough forced carries to contend with. There are many trees here, as well, but they don’t come into play a ton. 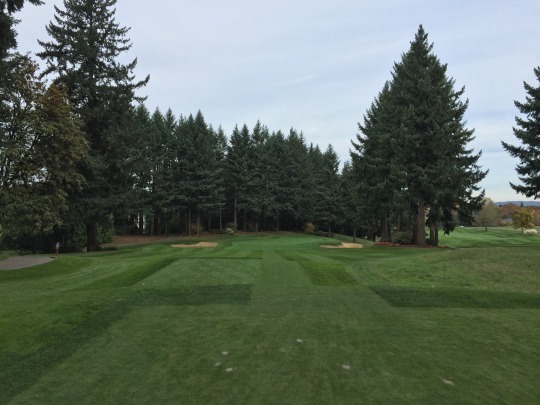 There are a handful of tighter holes on the back nine where the trees do factor in more than on the front. 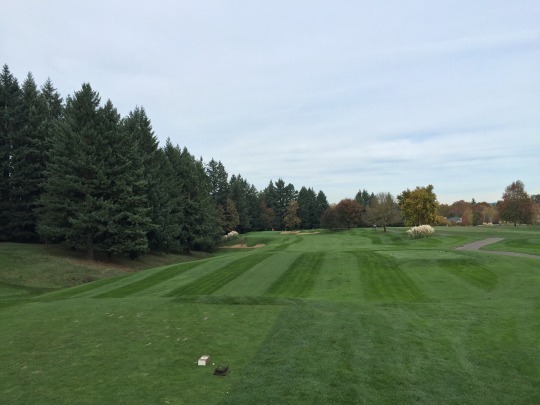 In an effort to soften up the course a bit, several holes were recently altered. My playing partner walked me through some of the changes. 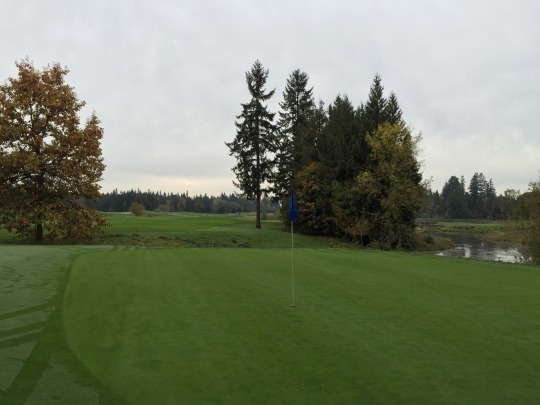 The most notable is the 12th hole, which used to be a very tricky par-5 and is now a simpler par-4. 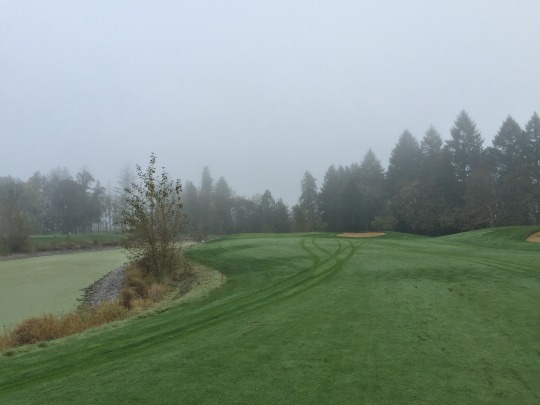 I can understand why this hole was not universally loved as there is a big ravine cutting across the fairway. 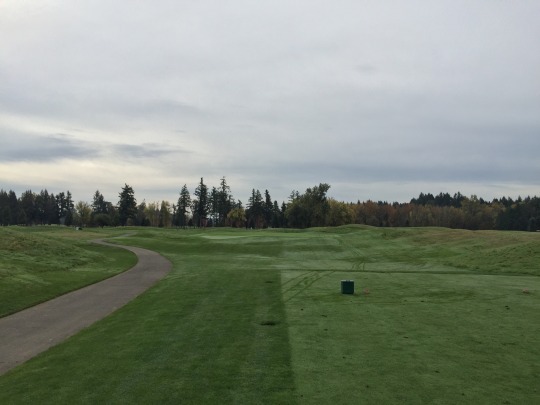 It was at an awkward distance that made it difficult to navigate for both long, aggressive hitters wanting to make it a two-shot hole and short, conservative hitters who were faced with a difficult second shot. My playing partner didn’t care for this change, but a guy I played with in my afternoon round said he likes the hole way better now. So, it depends on who you talk to I suppose. 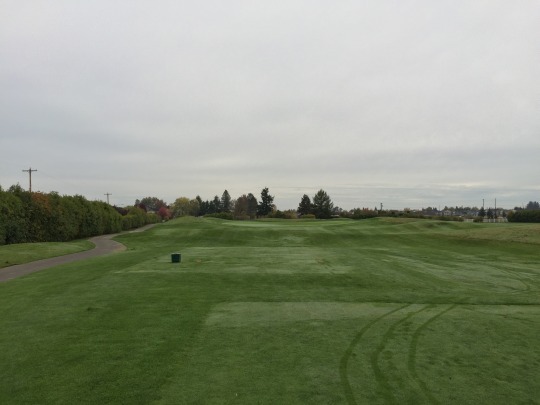 Though challenging, I felt the course was mostly forgiving off the tee with relatively wide fairway landing areas. 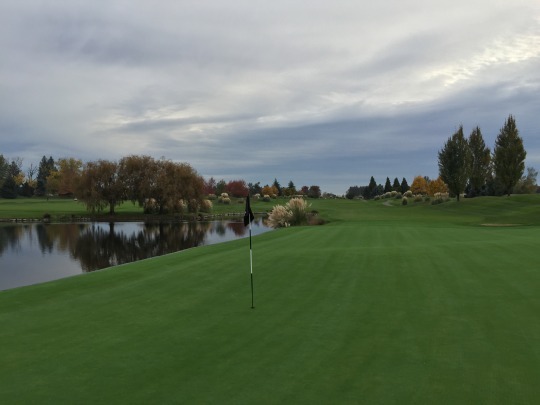 There are bail-out areas around most greens, so you have a reasonable chance to get up and down if you miss on your approach. 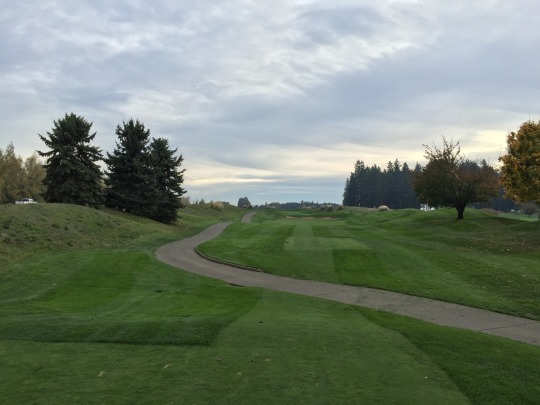 The forced carries and hazards throughout the course undoubtedly provide the biggest elements of challenge, but I never found anything so challenging enough to understand why locals might hate this track. 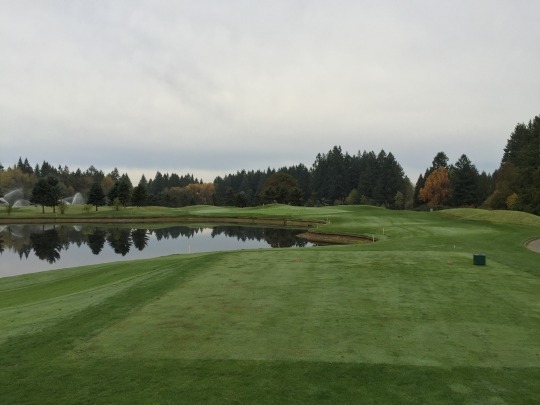 In addition to being an amazing deal, the course was in great shape. 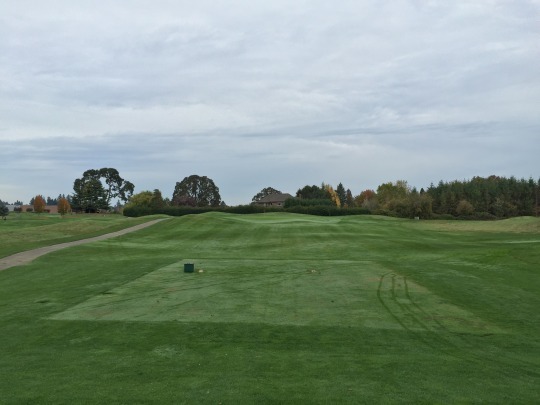 The tee boxes, fairways and rough were all lush and green with consistent coverage throughout. 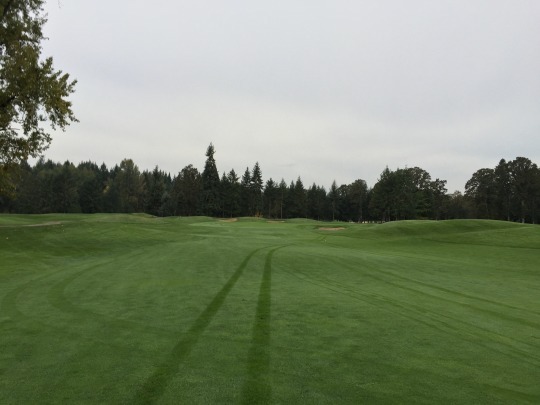 The fairways seem to drain well, so there weren’t many soggy/mushy spots. 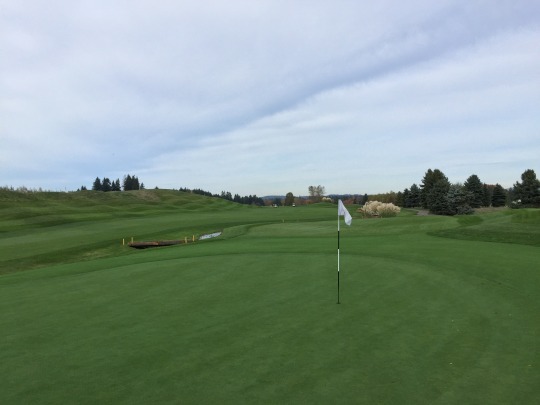 The greens were soft and rolling smooth at medium speeds. They punched about a month ago and are pretty much healed. 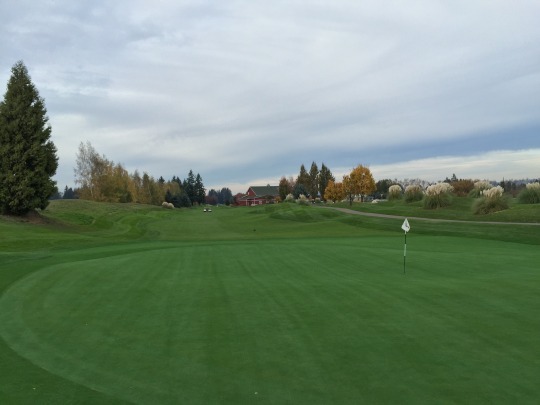 The back nine greens showed more visual remnants of the aeration than the front, but it didn’t affect anything. The bunkers were mixed. There was a maintenance guy going around and fluffing them up with the tractor, but he didn’t seem to be doing them all. One I found was just firm and muddy. The other was damp, but good. I wouldn’t hesitate to recommend Chehalem Glenn to anyone. 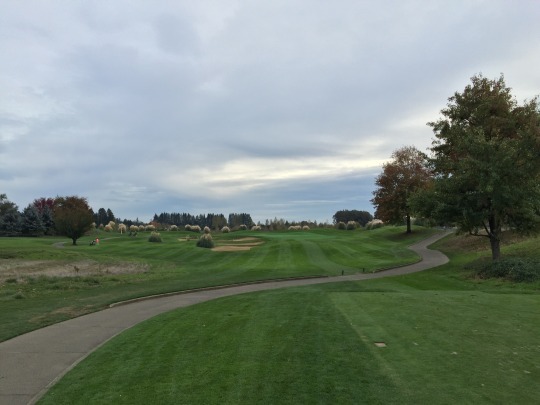 It’s a scenic course that represents its Oregon setting well. The layout is fun and challenging, but I felt like a good score can be achieved if you play the right strategies and execute your shots. This is a course I’ve always heard good things about and it clearly seemed to be one of the top public options in this region. I actually wanted to play here in the morning, but they didn’t have any tee times available until 12:54. Luckily, a single spot in that time was still open when I finished at Chehalem Glenn, so I gladly snatched it up. The place was rather busy when I showed up, but everything was running on time. The price was $51 ($39 plus cart). 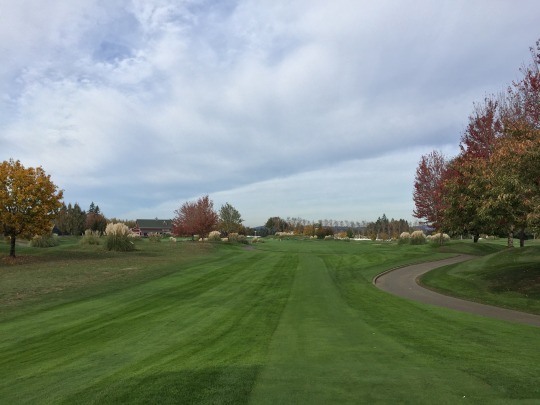 I opted for the cart on this round because I had already walked 18 holes. In retrospect, Langdon would have been a much better choice for the walking round compared to the hilly Chehalem Glenn. Oh well. I was paired with a twosome and another single. 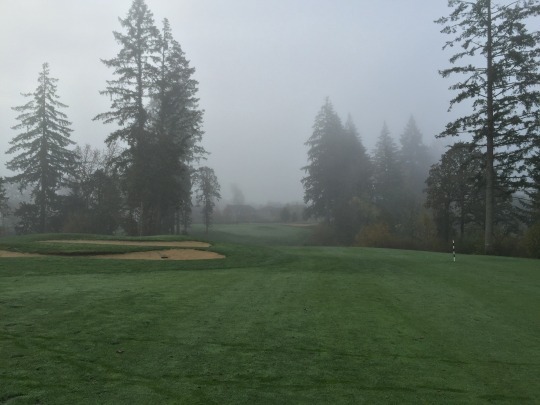 We teed off right on time and the starter had everyone moving along well at the first tee. We waited on most shots during the round, but everyone ahead kept pace and things went well. We finished in just over four hours on a very busy day, so you can’t ask for much better than that. 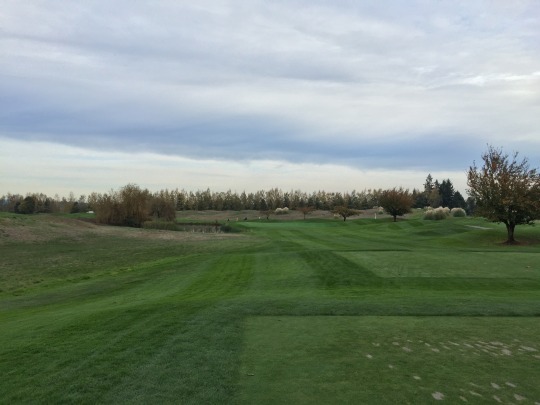 From what I knew about the course, I was expecting a semi-linksy farmland kind of track, reminiscent of some Midwest courses I’ve played. That is definitely the style at Langdon Farms for the most part, but there was more to this course than I realized. It lived up to the hype and probably exceeded my lofty expectations. 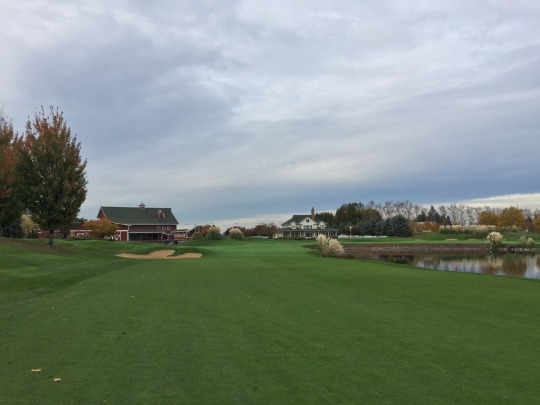 Langdon Farms was designed by Bob Cupp and John Fought, but it’s clear they pulled some inspiration from other designers and classic courses. I definitely sensed some Pete Dye inspiration on numerous holes. There are a couple railroad tie planked bunkers, stairs leading down into deep bunkers and plenty of mounding in the rough that all reminded me of Dye. The short par-4 4th hole felt very Dye-esque, as well. Then, you also have a few “tribute” elements mixed in. The short par-3 6th appears to be Langdon’s own version of the postage stamp hole at Royal Troon, with an anthill style green and no room for error on your tee shot. 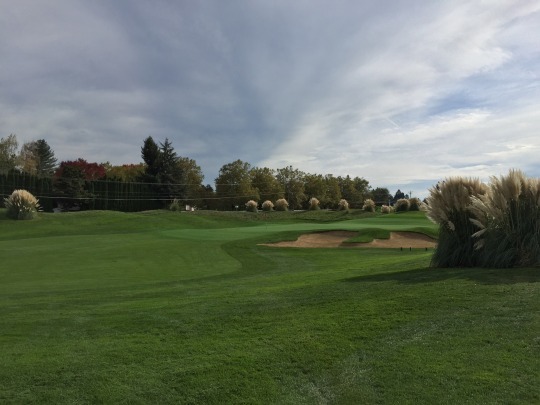 The church pew bunkers between the 8th and 9th fairways are an obvious ode to the famous set at Oakmont Country Club. I’m sure there are some other subtle tributes at Langdon Farms that I missed, too. 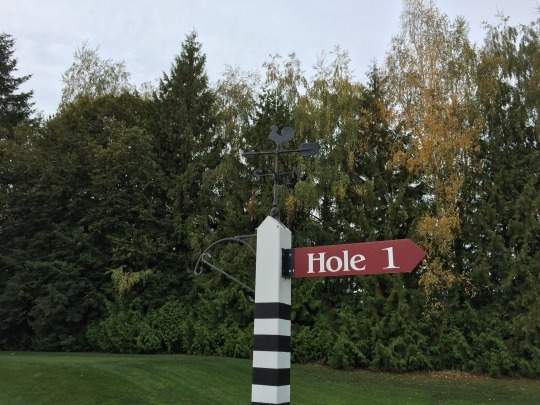 They definitely embrace the farm theme with a big red barn style clubhouse and the chicken-topped weather vane as a logo that sits atop every tee box marker. 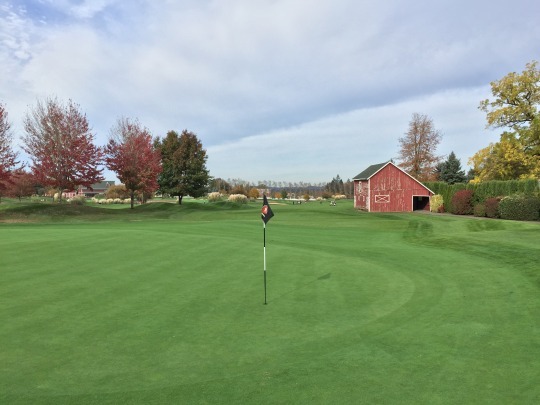 There is an old red barn that you drive through on your way up to the 8th green. I thought these touches were nicely integrated without feeling gimmicky. 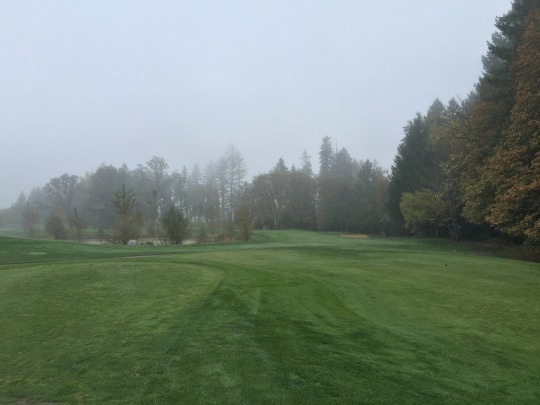 A few holes play into some wooded areas and there is nice landscaping throughout the property. It’s very pretty and not something I expected. Overall, the aesthetic presentation of this course is excellent. Even when you are struggling to score well, it’s hard not to enjoy your surroundings. 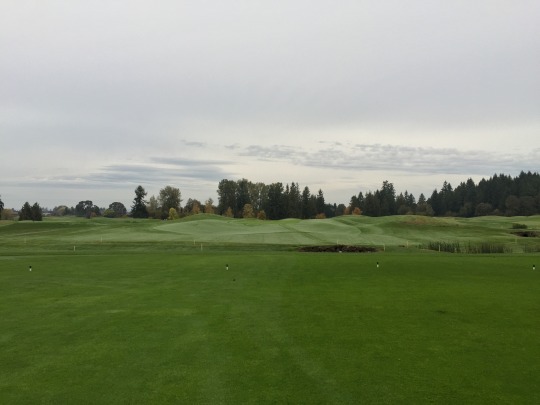 I will say the freeway noise on a few holes is somewhat distracting, but that is only a minor issue amongst all the good things happening at Langdon Farms. 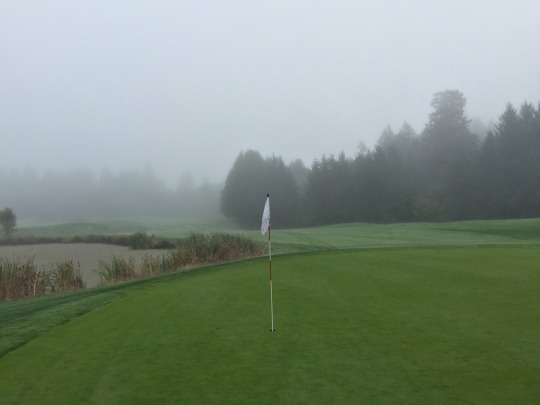 To top it all off, the course was in exceptional shape. 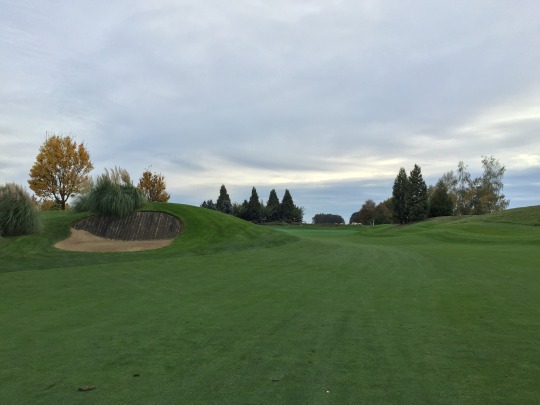 The tee boxes were excellent and the fairways were pretty much immaculate. The rough was thick and lush. It was not super deep, but just penal enough to make you work for a recovery. 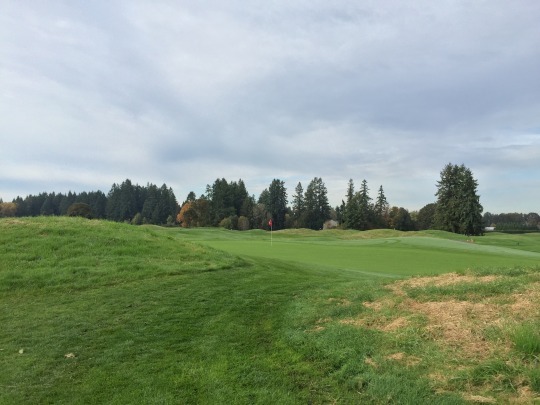 There are outer edges with thicker fescue rough that you definitely want to avoid. The bunkers were fantastic. 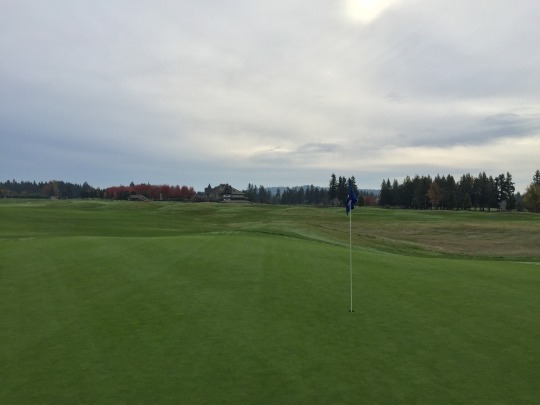 The greens were just a couple weeks out of aeration, but recovering very well. They were probably rolling a little slower than they usually do, but they were not bumpy and should be completely back to normal soon after I leave, especially with more rain about to come through town. 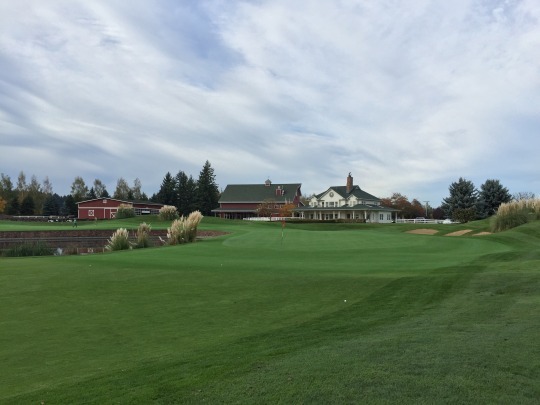 I will probably end up remembering the positive overall presentation and experience at Langdon Farms as much as the course itself. 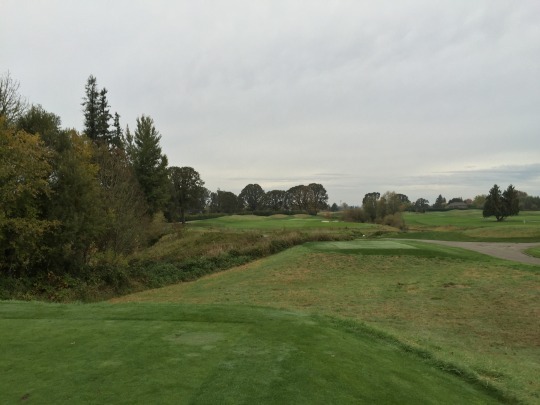 However, there are many memorable holes and the layout presents a lot of diversity. It’s forgiving off the tee with wide fairways, but if you miss a fairway you will have a tough lie and awkward stance. 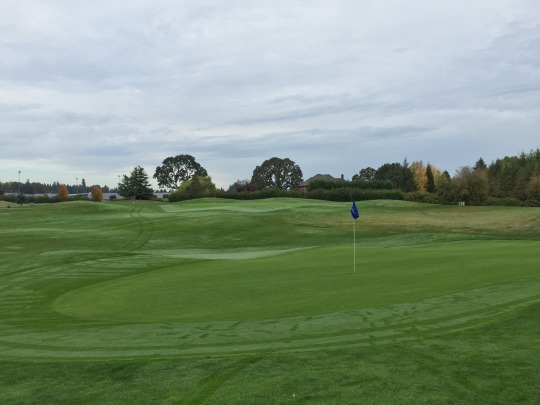 The greens have ample undulation and can be tricky to navigate. Overall, there’s a good diversity in the hole designs and lengths, so you get to use every shot in your bag. At times, it’s forgiving and at others, it is very demanding. To continue the farming thing, I would say Langdon Farms is definitely the cream of the crop in this region. 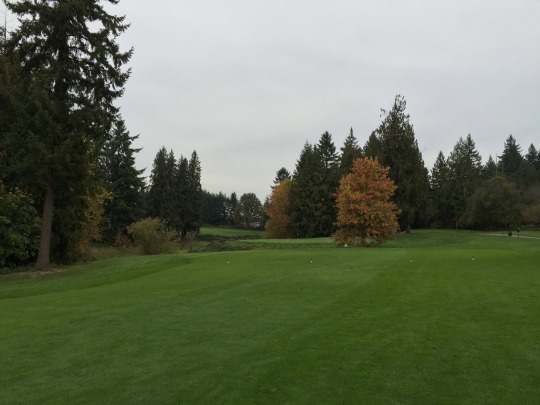 Personally, I would probably still rank Pumpkin Ridge (Ghost Creek) on top, but that course is rather expensive whereas Langdon is priced for regular people to enjoy a top-notch golf experience. 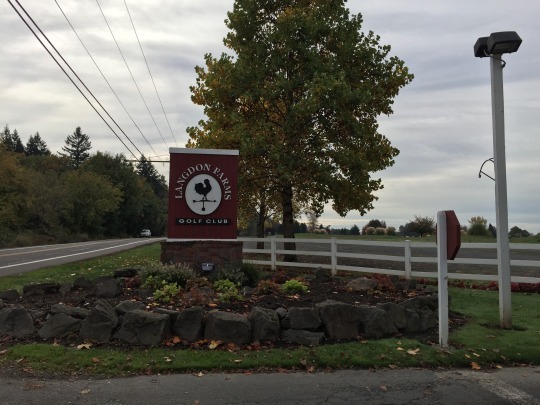 On the scorecards and on a big sign as you drive into the parking lot, they proclaim “Public Only.” I love that sentiment to position itself against stuffy private courses while offering a course and amenities that can rival any club around. 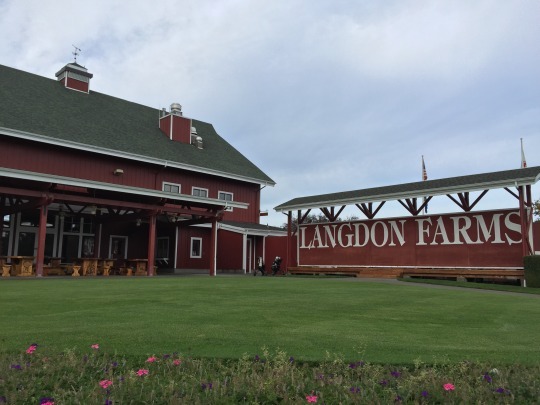 So yes, if you can’t tell, I really liked Langdon Farms!